It’s funny, when I was a kid I used to get exasperated because my mom was pretty strict and always wanted to know what I was doing, where I was going, and when I would be home. Now that I’m an adult I look forward to calling my mom several times a week and telling her what I’ve been doing and where I’ve been. I guess time changes things. Who would have thought that my mom and I would talk on the phone 4-5 times a week? It’s great having a mom who cares so much and also a mom who shares the same job. We are both special education teachers and it’s nice to have someone to talk to about what’s going on with education in our country, what’s going on in our classrooms, and the dreaded IEP’s. 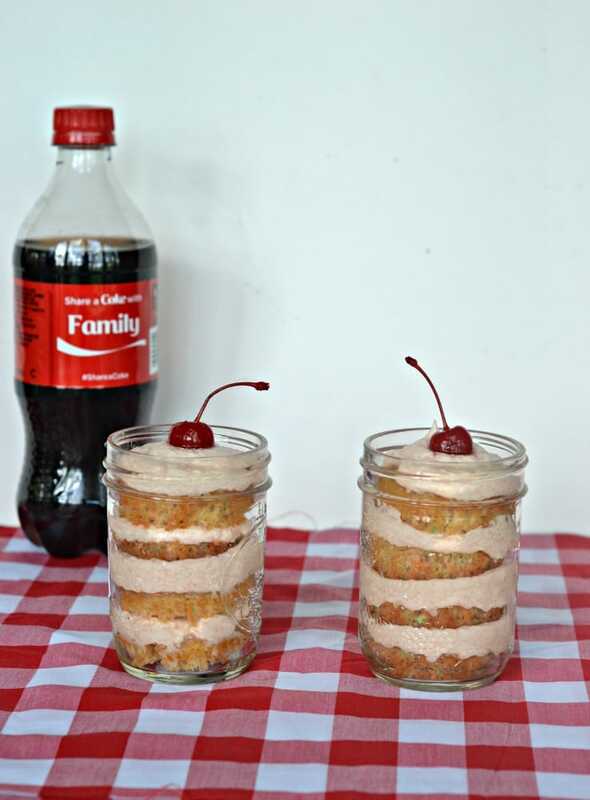 Since my mom and I share so much, I thought it would be nice to Share a Coke and a Coke Float Cupcake in a Jar with my mom this Mother’s Day! Did you know that Coke 20 oz. bottles now feature 1000 proper names? How fun is that? As it turns out, it’s even more fun then I thought it would be. My mom and I went shopping at Giant Eagle to get the ingredients to make the Coke Float Cupcakes and while we were there we wanted to pick up a few of the 20 oz. Cokes. When we opened up the cooler the first two bottles we found said “family” on them so I picked them up. There were also bottles that said “grad” on them so we picked up a few to take to my cousin’s graduation party next weekend. We thought it would be fun for him to have a Coke with a special name on it for his special day. My mom then picked up a bottle that said “Stephanie” and asked if she looked like a Stephanie. I laughed and told her I didn’t think so. She then picked up a bottle that said Katheryn and decided that this would be her new name for the day. Laughing, I picked up a bottle that said Matthew and told her that this would be my brother’s name for the day. She quickly picked up a bottle that said Destiny and decided that was a great name for my brother’s wife. I chose the last bottle for myself and I’ve always loved the name Summer so I quickly picked it up and put it in the cart. When my mom saw it she started laughing because she knows it’s one of my favorite names. After picking up the bottles, we also picked up a 12 pack of Coke cans to use when making the cupcakes. The cans have fun emoticons and sayings like BFF and and Love on them. When we got home we shared the bottles with my brother and his wife. They both got into the new names as well and soon we were all calling each other by our “new names” which caused a lot of giggling that day. My dad simply had the bottle that said Family on it which cause a whole new round of laughing. 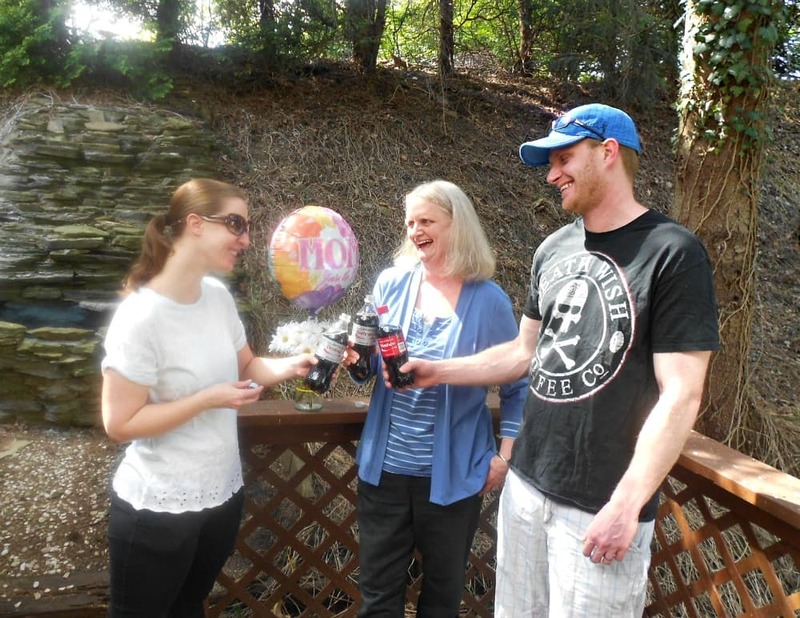 What started out as simply sharing a Coke with my mom on Mother’s Day turned out to be a day of fun and laughs. It was truly an awesome day. 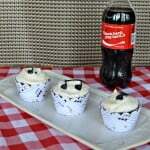 After enjoying our Cokes out on the porch I quickly whipped up a batch of Coke cupcakes. 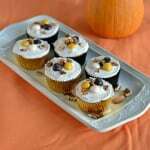 Now I’m not one to normally use a box cake mix but in this case it was perfect way to make these cupcakes. Once they came out of the oven I cut them into pieces and layered them in 6 jars in between fluffy cherry vanilla buttercream frosting. 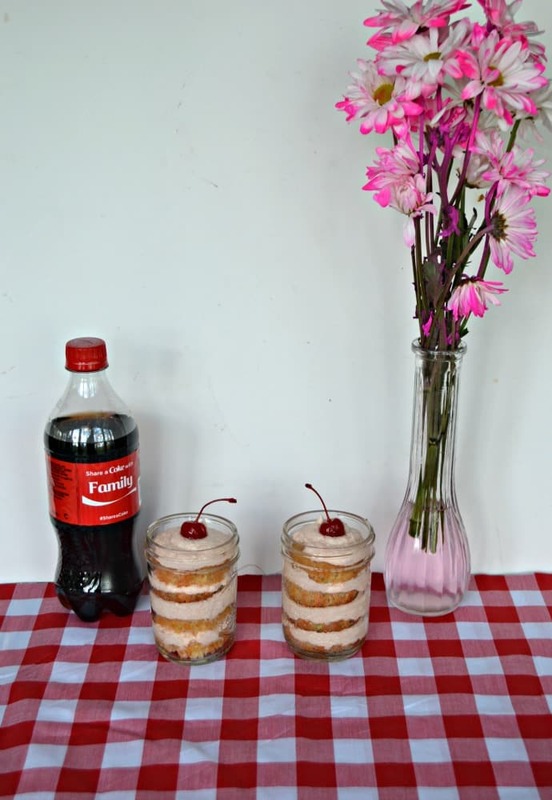 I finished the Coke Float Cupcakes in a Jar by placing a large amount of frosting on the cake with a cherry on top! As a side note, I made my cupcakes with a white cake mix because my brother can’t have chocolate. However, I’ve made Coke Float Cupcakes in the past using a chocolate cake mix and they’ve been delicious as well so either flavor mix can be used. I also set out nuts, sprinkles, and extra cherries for everyone to pile on top of their cupcakes if they wanted. Eating our Coke Float Cupcakes was the perfect ending to a perfect day. 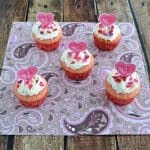 Coke flavored cupcakes layered with cherry vanilla frosting topped off with a maraschino cherry for a fun and delicious portable treat. In a large bowl combine the cake mix and the Coke. Stir until combined. Whisk in the oil and the eggs until well combined. 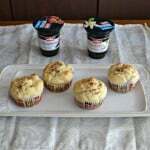 Pour the cupcake batter into the prepared pans, filling the cups ⅔ of the way full. Bake for 18-20 minutes or until a toothpick inserted into the center comes out clean. Meanwhile, in a large bowl cream the butter with a handmixer until smooth. Add in 2 cups of the powdered sugar and mix well. Stir in the Coke, maraschino cherry juice, and vanilla with a spoon. Add in an additional cup of powdered sugar and mix with the mixer. Add in as much remaining powdered sugar as needed to reach desired consistency. 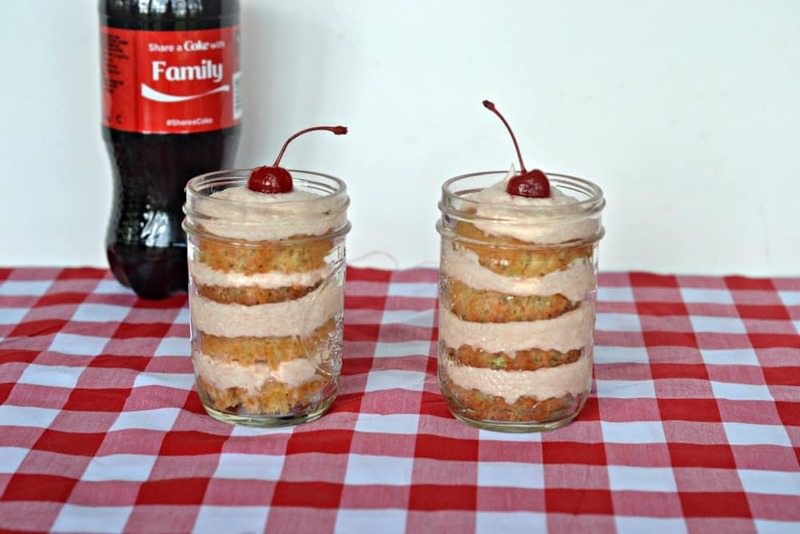 To make the Coke Float Cupcakes in a Jar remove the liners from 12 cupcakes and cut each cupcake in half. 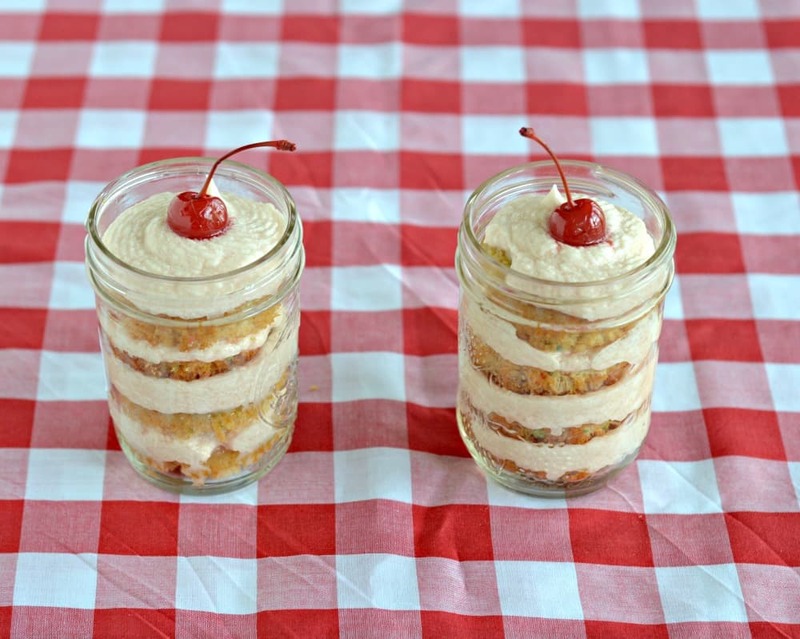 Place one half cupcake in the bottom of each mason jar. Pipe frosting on top of the cupcake. Place another cupcake half in the jar and then frosting. Repeat these steps until there are 4 cupcake halves with frosting on top of each. On the last bit of frosting, pipe it on until it is even with the top of the jar. Place a cherry on top of the frosting. Set out additional cherries, nuts, and sprinkles to put on top of the cupcakes. 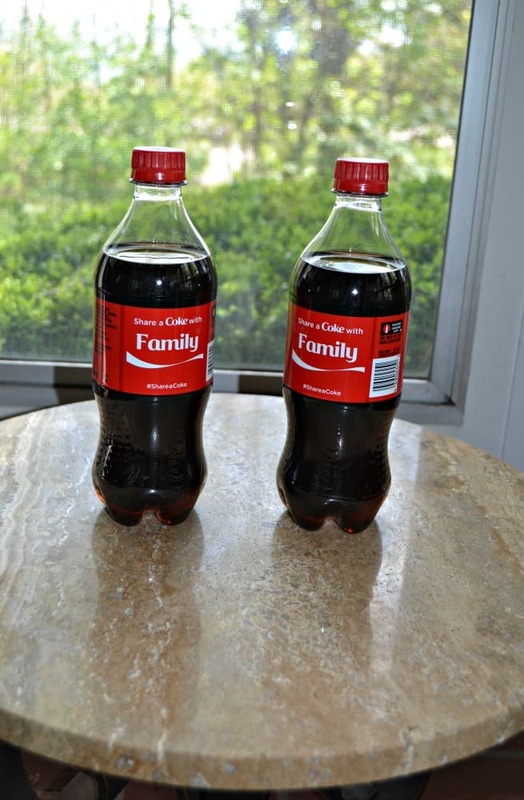 Want to see if your name is on a Coke bottle? Go to the Share a Coke site and search for your name! 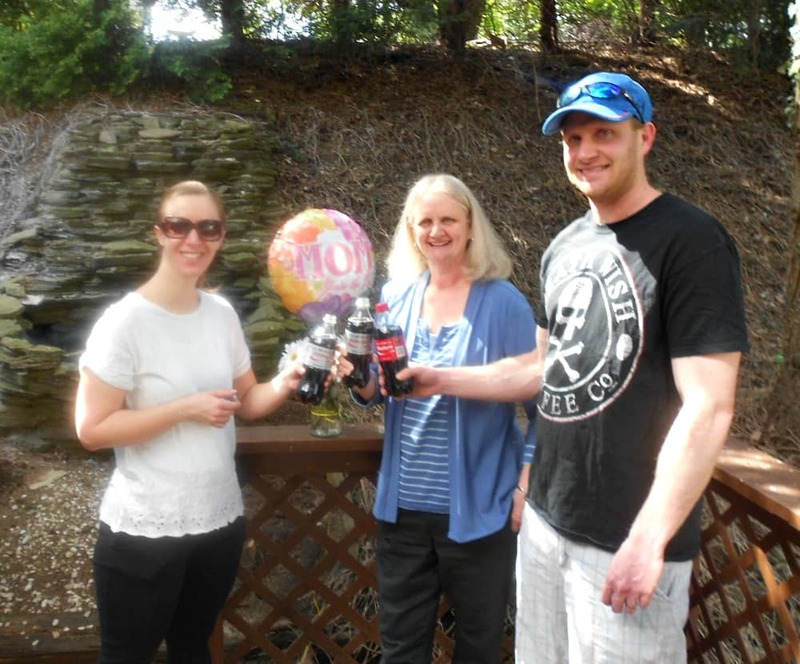 I shared my Coke with my mom for Mother’s Day but I’d love to hear who you would share a Coke with! 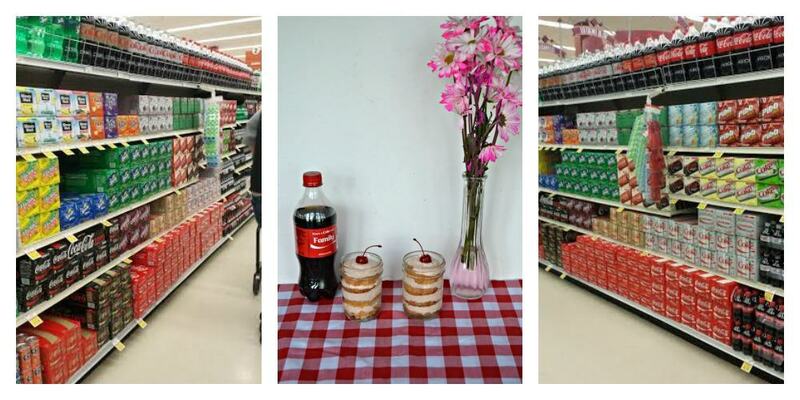 Who will you share a Coke with this summer? Sounds like a wonderful day spent with your mom. It is wonderful to have good memories and make new wonderful memories each and every day! Those are fun little cakes. How sad for your brother that he can’t have chocolate.